I was asked about composting recently and decided that it is easier to show how to do it rather then explain how to do it. In this blog I'll do both. First off, there is no way to make enough compost. 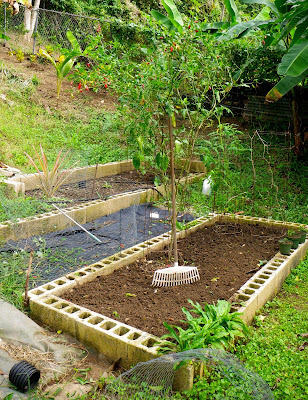 Here in the tropics the soil gets depleted of micro nutrients easily because of high rainfall. Throw out the idea of "mulching" things with compost because the next rain will simply wash it all away unless you are mulching things in pots or contained, raised beds. The biggest problem I have is that once I add my beautiful, loamy compost to my vegetable area the combination of heat and rain compacts it back down again and I am back where I started. Are these reasons NOT to compost? No. Composting is a wonderful thing! There should be compost factories here on the island since there is a huge amount of material. (There also shouldn't be garbage on the ground because trash pick up is free - oh well.) First you pick a spot you can have kind of messy. Yes there are barrels you can buy for hundreds of dollars that spin so you can aerate things, that look contained and official and neat - they cost a lot, don't make much, and rust so don't bother. You can contain an area with cinder blocks, wood, metal, cement, or just leave stuff in a big pile (my preferred method). You want it to be near where you will use the stuff so hauling it is easy. 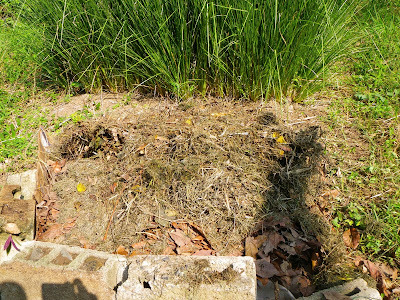 My "quick" pile is near my vegetable beds, down slope from my vetiver grass (erosion control) and near the hose so when it is dry I can "sprinkle water" it. I am lazy so I just throw a piece of cardboard over the weeds to start things off. 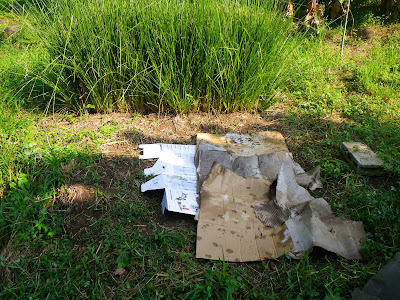 Cardboard is great material since is suppresses weeds, decomposes well and dyes now a days are water based so you aren't making a toxic compost. Every pile should have the first layer be "brown" chunky stuff. 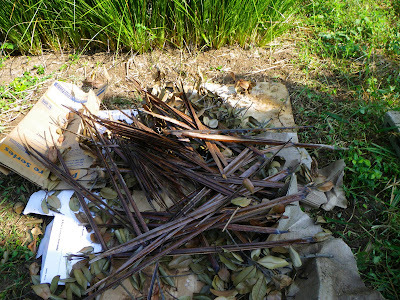 Good material for this is small twigs, branches, parts of palm fronds etc. You can use big branches but they take longer to decompose. Just chuk them on the pile. These chunky things will provide some aeration when things start to settle. After that I put some more "brown stuff" - leaves. I started the pile today since we mowed and trimmed a few days ago and I had piles of stuff along the driveway and all over. 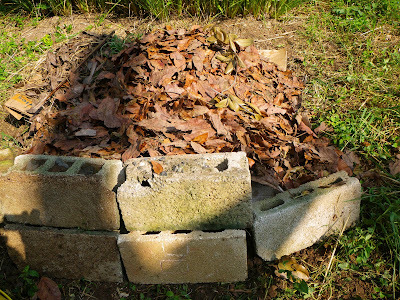 It has been windy and small twigs were all over, and since we are entering the dry season a lot of leaves are dropping off onto some concrete areas and I wanted to tidy up. 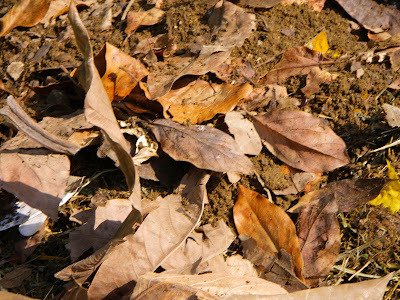 You want to leave the leaves where they drop if under trees and in plants since this is nature's way to make soil. When they fall onto lawns or concrete they are fair game. So I dumped them on and realized I needed some cinder blocks as the pile grew. Next you want the finer "green stuff" - in this case I used grass from when we mowed. It blew onto the driveway and I raked it into piles and left it there for a few days to dry out. This helps kill the weed seeds and mainly I was just lazy. The green stuff adds a little moisture to the pile. You do NOT want a wet, slimy pile. If your pile ever smells you aren't doing it right. Then I found some more leaves and dumped those on top. I raked them up from near the little wall under the avocado. Last time it rained dirt went over the wall and was mixed in the leaves as well. Sometimes adding a small layer of dirt kick starts the pile because there are micro organisms in it. Imagine this pile is a micro organism ballroom with new critters hearing about the new club and coming through the door at all hours! This is what you want - these guys are what are going to break down your material and turn yard waste into gold. Now you just have to wait and keep adding stuff. I keep all my kitchen waste in a zip lock in the freezer until the bag fills up and then I add it to the pile (this way I'm not running out there every time I cut an onion or not composting because I don't want to go out there). When you add kitchen stuff - "greens" - just toss it into the pile covering it a bit with the other stuff. For maintenance all you need to do it fluff the pile every once and a while when you see it getting flat. It is amazing how fast it does this. Fluff and flip and this will keep things aerated so nothing stinks and acts as an air conditioner for the microbes so they don't leave the dance floor. When things have reduced a lot you can sneak out crumbly compost from the bottom. That's it! The best compost I have is way up on the hill. When Jeff weed whacks I rake it all into big rolls and I am building flat terraces so it is easier to walk once my arboretum grows up. When we cut down the "bad" trees all the branches were laid out where I wanted to trails/terraces to be and then all the trimmed grass gets raked on top. There is awesome compost under there but if I steal it I won't be building up my trails! So now I am sidetracked into thinking I should start some seeds and move some starts into the real vegetable beds. First I have to get rid of these huge hot pepper trees! They are 5 or 6 feet and covered with red hot peppers - I already have so many in the freezer that I really don't want more. I dried some and ended up with burning fingers and hands for 3 days because I didn't wear gloves when I prepared them. Nope - out they come! I'll mix some fertilizer and sand into the beds and plant some stuff tomorrow. Just as a note, you can go to the sewage plant near the little Mayaguez airport and get a load of "compost" for about $8 a mini pickup load. It is a little "hot" (meaning not all the way decomposed) and it contains human sewage that has been treated. I was talking to owner of BoKeana Nursery and he takes that and mixes it with regular topsoil and sells it. He had it tested and it tested out very low in heavy metals which is usually the problem with the sewage compost. Since it is a little hot you need to compost it further before putting it around any trees or plants. This is a great price if you need some soil improvement around ornamentals. 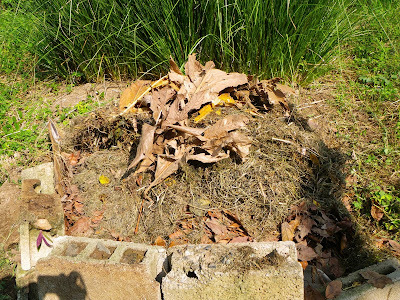 I prefer the idea of using all my yard waste since it has to go somewhere and I know it hasn't been treated, but if you are buying topsoil or compost from a nursery you may want to ask if it contains treated sewage - not that that is necessarily bad - just so you know. If you don't have enough yard waste ask your neighbors - chances are they put everything into garbage bags and sit it out near the garbage cans - free gold for the taking! So get excited and make some dirt today!